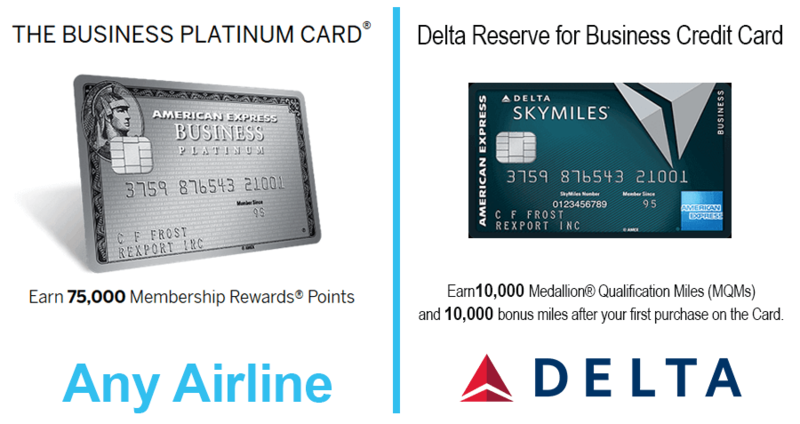 Which Premium Business Credit Card Is Right for You: Delta Reserve for Business vs Amex Business Platinum? Are you a small business owner or independent contractor who’s looking for a premium travel credit card? American Express has two excellent offerings that are packed full of perks: the Delta Reserve for Business and the Amex Business Platinum. As part of American Express Membership Rewards, the Business Platinum card is very flexible. The program allows you to transfer points to many different airlines, making it easy to get where you want to go. 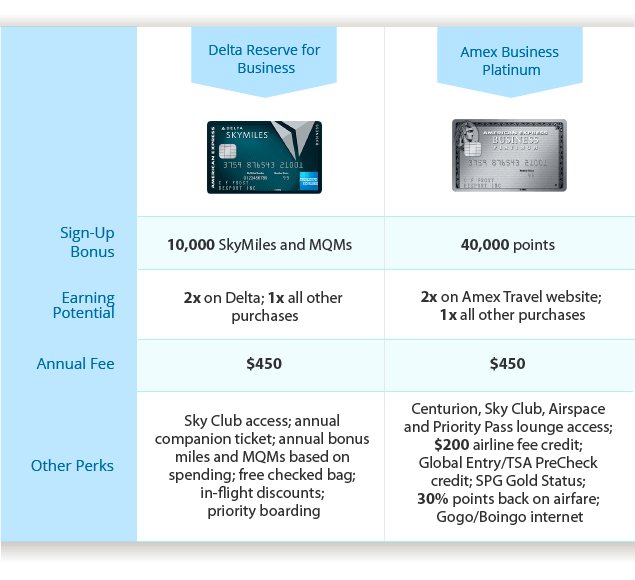 The Delta Reserve card, on the other hand, is limited to only one frequent flyer program, Delta SkyMiles. But that doesn’t necessarily mean it’s the inferior card, particularly if you often fly on Delta. It comes with many great airline-specific perks you won’t get with other cards. Which card is best for you? Let’s take a closer look. At first glance, the Amex Business Platinum appears to be the winner in this category. The card’s 40,000-point sign-up bonus, which is also available with the personal version of the card, is the largest regularly offered bonus from American Express. That’s four times bigger than the bonus that comes with the Delta Reserve card. But you don’t just get 10,000 miles with the Delta card; you also get 10,000 Medallion Qualification Miles (MQMs) which count toward elite status. It’s hard to earn status miles with any airline, which makes this a valuable benefit. Note that with the Platinum card you have to spend $5,000 within three months to get the bonus. At $1,666 a month, that’s a larger minimum spend than most cards have. You’ll get the Delta bonus after your first purchase. Sometimes the Platinum card’s sign-up bonus jumps to 75,000 points. That’s an excellent bonus if you can get it. Typically, though, it also comes with a very steep $15,000 minimum spend. If you can make $5,000 in purchases a month, it might be worth waiting for this offer. The Platinum Business card offers a lot more flexibility for spending points. As part of the Membership Rewards program, you can transfer points to 17 different frequent flyer programs. That gives you a ton of options, including Delta, JetBlue, Virgin America, Hawaiian Airlines, Air Canada Airlines and Aeromexico in North America; British Airways, Air France KLM, Virgin Atlantic, Alitalia and Iberia in Europe; Etihad, Emirates and EL AL in the Middle East; and ANA, Singapore Airlines and Cathay Pacific in Asia. If you can’t find the right flight directly from those airlines, you can also buy travel through the Membership Rewards Travel website. While you won’t get the most value out of your points, Amex has sweetened the deal a bit by giving you 30 percent of your points back. Unfortunately that offer applies only to one airline of your choosing. 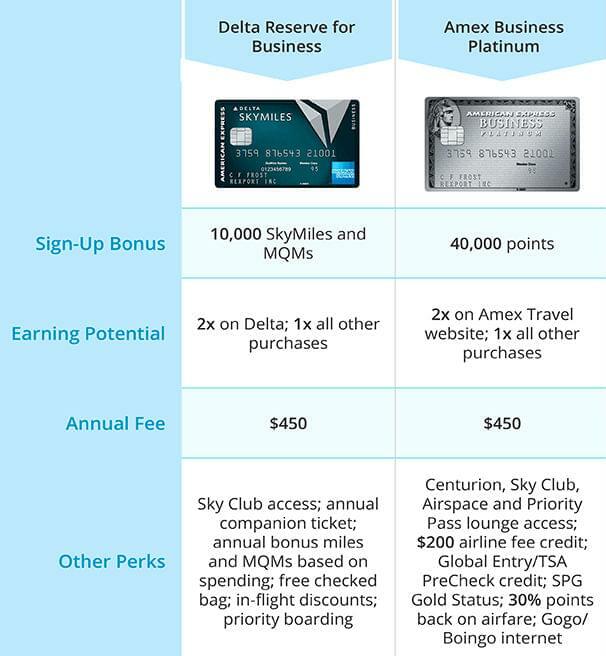 The Delta card may fall short in this category, but remember that Delta is part of the SkyTeam alliance. That means you can book award flights on any of the 20 alliance members through the Delta’s frequent flyer program, SkyMiles. While you’ll be able to get anywhere in the world with SkyTeam, being able to transfer your points to different frequent flyer programs allows you to get the most value for your points. That’s because different programs have different redemption rates and award available on their own flights and on partner airlines. These cards do not have very good earning potential. You’ll get double miles on Delta flights with the Delta card, and one mile per dollar for everything else. The Amex card might be even worse. You’ll get double points if you buy travel through the Membership Rewards shopping portal, and one point for everything else. If you’re not paying with points, there’s no reason to buy through the Membership Rewards website. The reason to get these cards is for all of the perks. Both cards come with free lounge access. 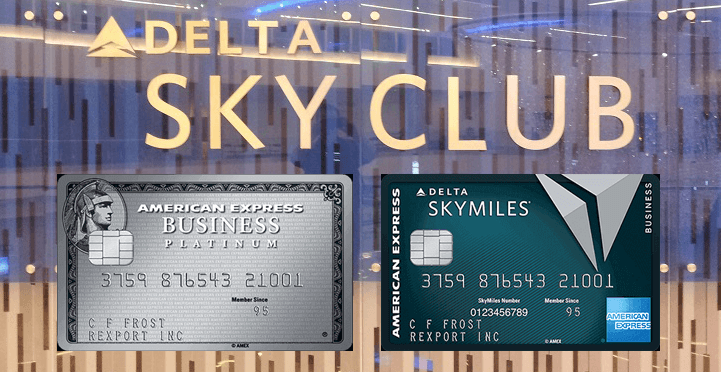 The Delta card gets you into Delta’s Sky Club, but only if you’re flying on a Delta flight. The Platinum card also gives you access to Sky Club, as well as the swanky Amex Centurion lounges and Airspace lounges. You’ll also get reimbursed for Priority Pass, which has over 900 lounges worldwide. In addition to better lounge access, the Platinum Business card has a few benefits you won’t get with the Delta card. You’ll get a statement credit to cover Global Entry or TSA PreCheck, free Gogo and Boingo internet (including in-flight service) and instant Gold status with Starwood Preferred Guest. While those are nice perks, they don’t really compare to the extras that come with the Delta card. First, every year you renew your card you’ll get a free companion ticket. For just the price of taxes and fees, which will not exceed $75, you can take a friend or family member with you on a round-trip domestic flight in either economy or first class. If you use the ticket wisely, it can easily be worth over a thousand dollars. The other unique benefit of the Delta Reserve Business card is what they call the Annual Miles Boost. If you spend at least $30,000 a year, you’ll get 15,000 SkyMiles and MQMs. With the sign-up bonus, that’s enough for Silver status without ever leaving the ground. If you make it to $60,000, you’ll get another 15,000 SkyMiles and MQMs. That’s just 10,000 MQMs short of Gold status. The best part is that you get 30,000 SkyMiles and MQMs every year you reach the minimum spend. The Delta card also gives you some smaller perks, like a free checked bag, in-flight discounts and priority boarding on Delta flights. The Platinum card offers a $200 statement credit that you can use to cover incidental airline charges, like bag fees. These cards come with all the cardholder benefits you’d expect from a high-end premium card. You’ll get car rental loss and damage insurance, baggage insurance, roadside assistance, travel accident insurance, purchase protection and an extended warranty on purchases. They also include concierge service and access to a global assist hotline. 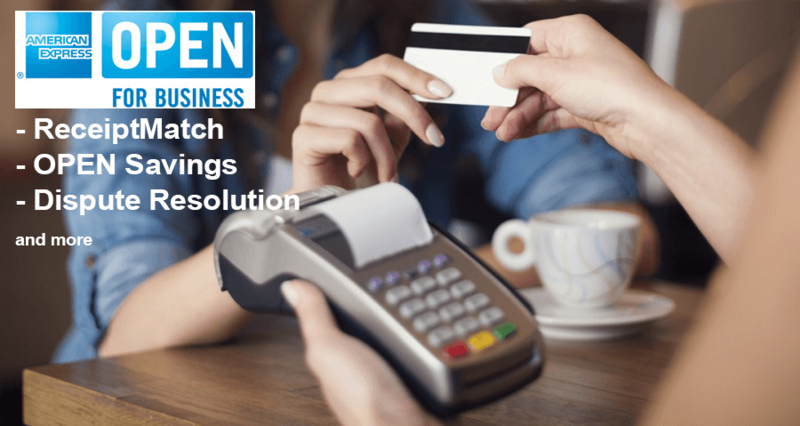 Both cards are part of the American Express OPEN program, which offers benefits to help small business owners, such as ReceiptMatch, OPEN Savings, Dispute Resolution and more. The hefty $450 annual fee is not waived the first year with either card. The benefits and perks, though, can easily cover that fee if you use them. Which Card Do You Get? If you fly on Delta, the Reserve for Business card has a lot to offer. The companion ticket alone can pay for the annual fee, basically giving you free Sky Club lounge access whenever you fly on Delta. Add to that the ability to maintain elite status every year you meet the admittedly high minimum spend, and it’s hard to go wrong. But if you don’t often fly on Delta, and you want to be sure you’ll always have access to a lounge, the Business Platinum card is a great option. The airline credit covers nearly half of the annual fee, and lounge access can easily be worth the rest, making the other benefits, such as free in-flight internet, Global Entry/TSA PreCheck reimbursement and SPG Gold Status, the icing on the cake.